If you deal with storage, you’re certainly noticing an increase in talk around object storage. Many analysts position it as a next big thing, something that may address the ever-increasing growth of unstructured data. Choose object storage products as alternatives to block and file storage when you need huge scalable capacity, reduced management overhead and lower cost of ownership. Build on-premises object storage repositories with the hybrid cloud in mind, and evaluate their API support and level of compatibility. Select object storage vendors that offer a wide choice of deployment (software-only versus packaged appliances versus managed hosting) and licensing models (perpetual versus subscription). There are certainly some interesting capabilities offered by object storage solutions (metadata search, global accessibility, etc). However, the most common reasons for customers’ interest in object storage are large storage capacity, with huge amount of documents, for (perceived) lower cost. Today, the majority of customers’ on-premises unstructured data is stored on NAS systems. The data is being accessed by numerous applications – all using well-known file protocols, such as NFS and SMB. Object storage uses different protocols – Amazon-driven S3, OpenStack-driven Swift, SNIA-defined CDMI and numerous other proprietary protocols coming from over a dozen different object storage vendors. This was not the first time I met a potential customer who had been driven to something new, which he potentially didn’t really need, because of excessive marketing. As I wrote earlier, INFINIDAT offers a highly-scalable NAS solution as part of our unified storage, which allows customers to have highly-reliable, PB-scale NAS to store billions of files with attractive economics and familiar file access. This solution might be more than sufficient for that customer. In addition, INFINIDAT NAS offers multiple additional capabilities, such as high throughput and low latency, efficient snapshots, compression, thin provisioning, data replication, etc. INFINIDAT has numerous customers who run large scale on-premises storage environments leveraging our InfiniBox systems. Many of them are thinking about the way to bridge between their on-prem environment and a public cloud. In my next post, I’ll describe how InfiniBox file and block storage can be used in public clouds, such as AWS and Azure. This may provide the easiest path for transition from private cloud into a hybrid deployment, without the need to invest in adoption of new protocols. Object storage can certainly be attractive for those willing to invest in the new generation of applications, which may leverage new capabilities such as rich metadata and search capabilities. We’re working on several offerings in this space as well, leveraging our reliable storage as a basis for object stores for those who might really need one. Reduce demand for multiple replicas or CPU-hungry erasure code calculations common with traditional object deployments. 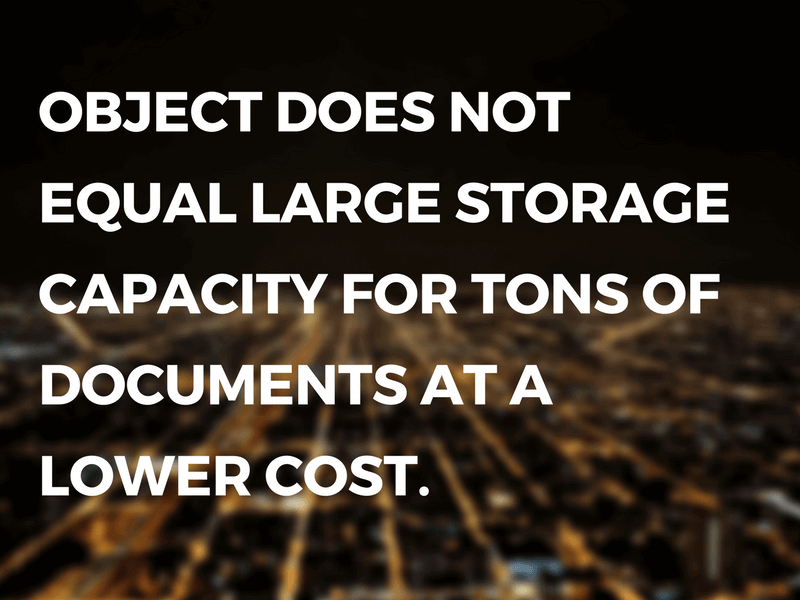 Object storage is a great technology, and many customers can benefit from it. However, it is not a replacement for modern, scalable NAS systems. At INFINIDAT, we see growth in all domains – block, file and object, and we’re working with our customers to support their private, hybrid and public-cloud based needs. 1 Gartner “Critical Capabilities for Object Storage” by Arun Chandrasekaran, Raj Bala, Garth Landers, March 31, 2016. Gregory Touretsky (@gregnsk) is a Senior Director, Product Management at INFINIDAT. He drives the company’s roadmap around NAS, cloud and containers topics. Before that Gregory was a Solutions Architect with Intel, focused on distributed computing and storage solutions, data sharing and the cloud. He has over twenty years of practical experience with distributed computing and storage. Gregory has an M.S. in Computer Science from Novosibirsk State Technical University and an MBA from Tel-Aviv University.